The Systems, Networking, and Energy Efficiency (Synergy) lab is at the School of Computer Science, at Carnegie Mellon University. It is led by Professor Yuvraj Agarwal. Our lab was started by Yuvraj at UC San Diego and we continue to have close ties and collaborations with colleagues in that department, including the MESL Lab. Our research focus is on designing systems with the goal of improving energy efficiency at all levels. As such many of our research projects span hardware systems (embedded/sensors) and software systems with students acquiring experience in either or both areas. We focus on project with a high societal impact and relevance and aim to develop and deploy our resarch at scale. Recent examples include multiple Smart Building related projects that have been deployed across a Building (Occupancy based control, SleepServer, Sentinel) and at a campus scale at UC San Diego (Energy Dashboard). Another example is our ProtectMyPrivacy project currently in use by over 150,000 iOS users! To see our current research efforts, click on the research link. Our publications are listed on our publications page. Our lab is located in Wean Hall (3rd Floor, Room 3306) at CMU. Some of our existing students on the UCSD campus are located in CSE 2113. Dr. Yuvraj Agarwal's office is in WEAN Hall @ CMU, Room 5313. Our logo consists of three hexagons, each repesenting a focus of our efforts. The top represents the hardware of our systems, the bottom represents the software that runs our systems, and the right represents that our systems are meant to make positive contributions to energy management and make the world a "greener" place. Thus our driving force is the synergy of these three. Our SYNERGY Lab is a part of the Institute for Software Resarch (ISR), within the School of Computer Science at Carnegie Mellon University . We also continue to have a presense at the Department of Computer Science and Engineering at UC San Diego through our collaborators and existing lab members, primarily to support our smart building deployment project. 09/2018 Project on Building End-to-End support for Privacy in the Internet-of-Things is Awarded! Thank you NSF! (Award: #1801472). 08/2018 Project on Sensei - Building a Smart Classroom using sensing, computer vision, machine learning is Awarded! Thank you NSF! (Award: #1822813). 07/2018 Three papers accepted to ACM BuildSys 2018 . Scrabble, Plaster and Pible! Congratulations Jason, Bharath, Francesco! 06/2018 Our new paper on dependencies across web services is now online! 02/2018 Our BRICK paper now appears on Applied Energy journal! 11/2017 Our new BuildSys poster on converting unstructured metadata into Brick is now online! 10/2017 A new paper on applying transfer learning to construct performance models across environments is online! 10/2017 Our IoT'17 paper on providing easy-to-use, unified end user environment for IoT is now online! 09/2017 Two papers (PrivacyStream, ProtectMyPrivacy) on mobile privacy got accepted to UbiComp'17. They are now online! 08/2017 Our paper on protecting mobile users' privacy by using traffic analysis in now online! 12/2017 Our vision article on supporting multi-device interaction in the new Internet of Things (IoT) era is now online! 11/2016 Our new BuildSys paper on BRICK: unified metadata schema for buildings won Audience Choice award in BuildSys 2016! Also check out our demo about supporting portable queries with Brick schema across different buildings! 07/2016 Our Ubicomp 2016 paper on GENIE: a 2 year study on Hardware/Software Thermostat usage in Buildings is now online! 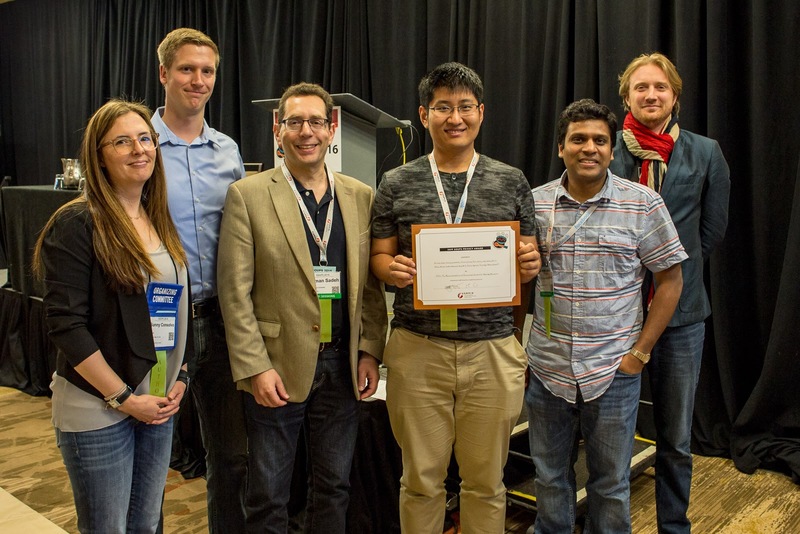 06/2016 Project on Handling Trillions of Flaws on Billions of Internet-of-Things Awarded! Thank you NSF! (Award: #1564009). 06/2016 Our USENIX SOUPS'16 paper just won the IAPP SOUPS Privacy Award! [PHOTO] Congratulations Bin, Hazim, Mads and Florian! 06/2016 Our USENIX SOUPS'16 paper on the various factors affecting privacy policies and notices and their efficacy is online! Our USENIX SOUPS'16 paper showing how privacy assistants help users manage privacy on SmartPhones is online! 05/2016 Two papers accepted accepted to SOUPS'16. Congratulations Joshua, Florian, Bin, Mads, Hazim! 03/2016 Our IEEE Computer invited paper outlining our vision in the GioTTO IoT Expedition is now online. 02/2016 Received a Google Faculty Research Award for our work on Mobile Privacy! Thank you Google! 10/2015 Our IoT Security Vision paper accepted to HotNets 2015. Congratulations Tianlong Yu, Vyas Sekar and Srini Seshan. 08/2015 Zodiac: Organizing Large Deployment of Sensors to Create Reusable Applications for Buildings, has been accepted BuildSys 2015. 02/2015 Rahul Mangharam @ UPenn and Yuvraj Agarwal are serving as TPC Co-chairs for BuildSys 2015.